Pablo Iglesias returned to active duty on Saturday as general secretary of Podemos with a fiery appearance at a party rally in Madrid, following months of absence from Spain’s political scene since opting to take three months of paternity leave at the New Year. Amid the growing likelihood at the end of 2018 that Spanish President Pedro Sánchez might dissolve Congress and call snap general elections for early 2019, Iglesias announced at end-December that he was taking leave to care for twins born prematurely in July to his partner Irene Montero. Montero, who is the spokesperson for Podemos in Spain’s Congress and considered to be the third-most important leader within the party, had been out of action on maternity leave since the birth of twin boys and Iglesias said he was stepping up to share in the parenting responsibilities and allow her to resume her political career. Iglesias’ own return on Saturday comes after a series of controversies and setbacks that have tarnished Podemos’ standing in the public’s eye. Once thought to be poised to surpass the Socialist party as Spain’s leading left-wing force, Podemos now finds itself beset by high-level resignations, fragmentation of some of its regional election coalitions and relegation to fourth or even fifth place in some voter preference polls, projected to lose nearly half the seats held by its Unidos Podemos electoral coalition in Congress in upcoming general elections slated for 28th April. Some within the party consider the fist-pumping, fiery left-wing rhetoric that Iglesias exhibited at Saturday’s rally in Madrid to be just the kind of combative stance the party needs to get back on its feet. 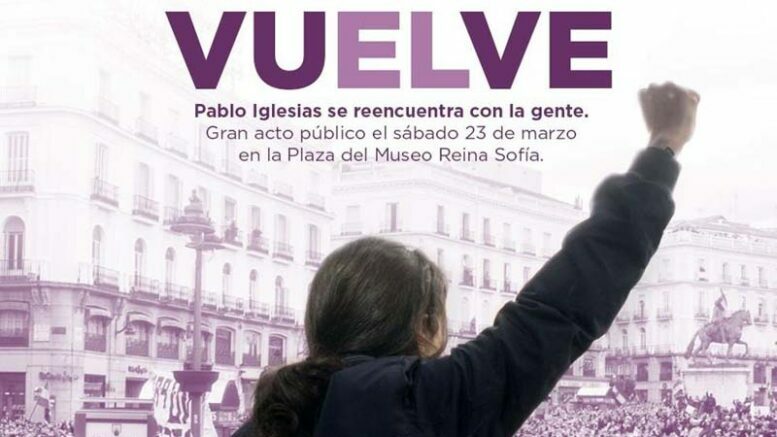 But for others, a party poster issued earlier touting his return that featured Iglesias before a crowd with clenched fist and the words “EL VUELVE” (“HE RETURNS”) writ large carried a bit too much of a messianic “strong man” message that clashed with the purple feminist shadings of the poster. Particularly so, given that Podemos actively markets itself as a feminist party and has portrayed its general secretary as a feminist male and one obviously willing to set his career aside for a time to shoulder parenting duties. The controversy over the poster erupted onto social media, prompting Iglesias to distance himself from the maleness of the message and as suggestions have begun to surface for the need for a ‘Vistalegre III’ all-party conference to set Podemos back on course, Montero made headlines and raised some eyebrows within the party by remarking during a nationally televised interview that she was certain that the next general secretary of Podemos would soon be a woman. Clearly the first in line for such a leadership change, Montero was the most-voted woman in leadership balloting at the Podemos’ 2017 Vistalegre II conference, receiving the fourth greatest number of votes after Iglesias, party Organization Secretary and spokesperson Pablo Echenique and Íñigo Errejón, one of the original team of Podemos co-founders who has since left the party. Also splitting with the party in recent months — and inadvertently clearing a path for a woman toward any change in the party’s top leadership post — have been a significant number of other women in Podemos leadership positions. These include party co-founder Carolina Bescansa and several others who supported Errejón in his running battle with Iglesias over the party’s political direction and what many criticized to be overly centralized and predominantly male control of the party under Iglesias’ leadership. Beset by damaging internal disputes that have triggered to resignations by party leaders and facing splits in several of its regional election coalitions in the run-up to national elections in April and regional, municipal and European parliamentary elections on 26th May, Podemos has nevertheless managed to seal for the a re-edition of its 2016 Unidos Podemos general electoral coalition with Izquierda Unida (IU, United Left) and environmentalist party EQUO. This time, however, and in keeping with the party’s feminist branding, the new name for the 2019 electoral coalition is Unidas Podemos — swapping out the masculine “o” in Unidos for the feminine “a” ending in Unidas. Yet another sign that the party is en route to a woman in the top leadership spot in the near future? Perhaps, but if that leader is to be Irene Montero, the couple will have to clear another hurdle that will undoubtedly again involve parental leave for both Iglesias and Montero — earlier this month, Montero announced that she is again pregnant and the Podemos political power couple are expecting the birth of a baby girl sometime this summer.